We hold massage courses in Australian cities throughout the year. Read more about our courses in each location by selecting a city below. We also hold Raynor massage course all over the world. Please see our Worldwide Raynor Massage Course Calendar for more details. Our 5 day Raynor Massage Certificate Course is an intensive combination of deep tissue massage, remedial massage, acupressure, Swedish and therapeutic massage plus a lot of our own techniques. The Raynor Massage Diploma Course also includes an introduction to aromatherapy and an introduction to foot and hand reflexology. 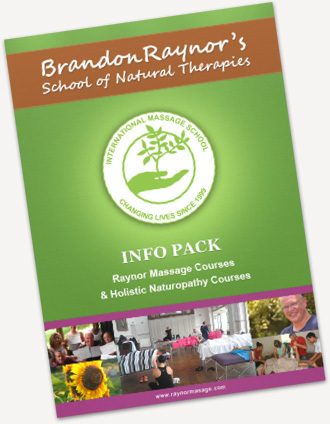 Brandon Raynor, the founder of the school, personally teaches all of his Advanced Massage Diploma Course. Students completing our massage courses in Australia are able to practice afterwards, set up their own business or work as they see fit. They will also be able to obtain full comprehensive medical malpractice insurance after completion of the course. If you’d like to learn more, watch the video below. We first started offering massage courses in Sydney, Australia in Bondi Junction in 1997. At that stage, our courses were for 8 weeks on Saturday mornings at the Bondi Pavilion. In 2000, we started teaching massage courses in Brisbane, in the newly opened Paddington House of Natural Therapies. These courses were very successful as people were ready for a massage course that was practical, hands on and without all the filler subjects that a lot of the other massage schools had to offer. By 2001 we started to offer our massage courses in Murwillumbah and the Gold Coast and then later on we expanded to offer our massage courses in Melbourne. These were originally held at the Firm n Fold Massage Table Factory in Collingwood and later at the Melbourne Rowing Club and the Northcote Town Hall. Our massage courses are now taught from North Melbourne. We also held massage courses in Darwin, Perth and Adelaide in 2001, and in 2002 we held our first massage course in Hobart Tasmania. Our massage courses are now taught all around Australia, and we have further expanded into 11 different countries, including Canada, the UK, the United States, Ireland and New Zealand.